From the acclaimed author of The Darlings comes an incisive, hilarious, and tender exploration of fatherhood, love, and family life through the story of a widower who attempts to become the father he didn’t know he could be. 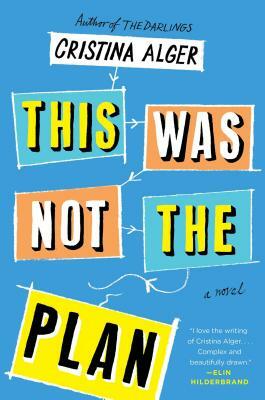 At turns heartbreaking and hilarious, This Was Not the Plan is a story about loss and love, parenthood, and friendship, and what true work-life balance means. "THIS WAS NOT THE PLAN has everything I love in a story: wit; fresh, stunningly human characters; pitch-perfect sentences; piercing emotion; a big, gorgeous mess of a family; and a big, gorgeous heart. As soon as I finished, I wanted to read it again." "I love the writing of Cristina Alger. Her characters are complex and beautifully drawn. I lost myself in THIS WAS NOT THE PLAN." "Note to reader: clear your schedule before you start this book, because you won't be doing anything else till you finish it." "With compassion and humor Cristina Alger delves into the lure of the 1%, while deftly exposing the cost that life exacts—a cost beyond price." "Alger’s (The Darlings) new novel of love, loss, and parenthood is readable and relatable...uplifting and memorable." “This Was Not the Plan proves a delightful read about parenting, love and plans gone awry." "Alger's darkly comic novel offers an engaging take on single parenthood from a man's viewpoint." "Cristina Alger invokes humor and heart with This Was Not the Plan."